Ever since laying my eyes on Fangirl almost 3 years ago, I’ve been a whole-hearted advocate for Rainbow Rowell. I devour everything she writes, and (im)patiently wait for her to publish something new to fall in love with. Thus, I knew that Landline would fling me from the reading slump I felt creeping in at the edges of my conciousness. Whilst Landline certainly wasn’t my favourite Rainbow Rowell book, I still loved it astronomically more than plenty of other books I love. Rainbow Rowell just has a certain effect on me, her words casting an irrefutable spell on my better judgement, and enchanting the pages to flip on their own. I have delayed so many tasks to read a Rainbow Rowell book, and never regretted it even a tiny little bit. The thing is, to read a Rainbow Rowell book is a full-body experience; you can’t just reserve a section of your mind for you current read if it’s a Rainbow Rowell book. Oh no, the book takes over your mind, body, and soul, making your fingers twitch irrepressibly in search of a page to turn. Like any Rowell book, the characters of Landline are vivid. So utterly and completely realistic and vivid, it’s only the indents my fingernails etch into my palms as I squeeze my hands into fists as the characters fall in love that remind me that I’m not right there with them. And everything they do and say and think and know is real. They are real people with real problems, and their stories are not idealistic but realistic. 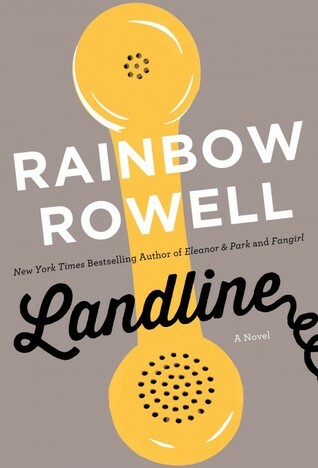 And that’s why I love Rainbow Rowell’s books, and Landline is no exception. This novel opens to the haphazard, busy life of Georgie, our protagonist, who is a married mother of 2, as well as a workaholic (she’s a TV screenwriter…so awesome!). She narrates the story, jumping between the past and present and places in between, illustrating for the reader what married life means to her, and what she has taken from it. Now, whilst this book does orbit marriage, this is not to say that you won’t enjoy this book if you are not married yourself. I am 15 and was interested in everything Georgie had to say on the topic, entertained by her narration and attitudes and humour. In fact, I was utterly engrossed! On another note, the tone of this book, although dealing with serious themes, is light-hearted and jovial and wholly effective if you’re looking for a pick-me-up. The chapters are fast paced, with injections of humour with each page, so much so that there are many witty moments, and even laugh-out-loud moments. Overall, whilst I was apprehensive to read this novel (the first Rainbow Rowell book I’ve read that is aimed at adults), I found myself engrossed in the story, and entirely pleased I decided to give it a chance. Although I describe it in this manner, there wasn’t any astronomically amazing attributes of this book, explaining as to why I awarded it 4/5 stars. As aforementioned, Georgie – the protagonist of this novel – is a screenwriter, a job that would be interesting to pursue in my opinion, and so I am entering this novel for the number 25 spot on the Around the Year in 52 Books challenge: A book whose main character is in a profession that interests you. Yay! I’ve been a bit hesitant about this book but now I’ll definitely give it a shot! Loved your review! I felt the same at first, but it was definitely worth it! Thanks so much! !